The systems are designed to construct thermally insulated sliding doors and windows, which may be built in brick walls, aluminium façades, winter gardens or window display constructions based on the MB-59S or MB-59S Casement elements. Sliding doors, especially the ones of large dimensions, visually “enlarge” the living space, by connecting it with an outside terrace or a garden. The MB-Slide and MB-Slide ST sliding door systems offer a wide range of space arrangement possibilities with maximum dimensions of leaves: H: 2600 mm, L: 1800 mm, max. weight 160 kg. There are available different constructional variants from 2 to 6 modules. They may be fitted with glazing sets up to 26 mm wide. 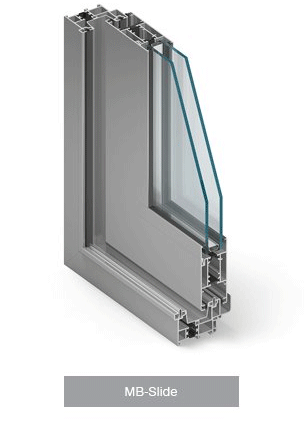 These constructions also ensure very good technical parameters: plastic thermal breaks guarantee suitable thermal insulation of aluminium profiles, while sliding brush gaskets or gaskets made of thermoplastic elastomer TPE, combined with EPDM closing and glazing gaskets, enable obtaining high tightness of the construction. Constructional depth of leaf profiles is 37 mm (apart from horizontal profiles in the MB-Slide ST) and of frames 50 mm and 97 mm for double track frames and triple-track frames respectively. 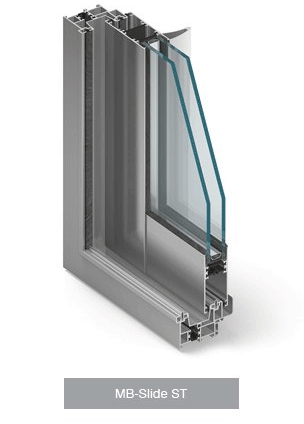 The same depth of basic double-track frames in the MB-Slide system and window or door frames of such systems as MB-59S, MB-59S Casement, MB-59S Pivot and MB-59SE allow to directly join products based on these systems. Frames of depth other than 50 mm may be joined with each other via a special strengthened intermediate mullion. The basic difference between the MB-Slide and MB-Slide ST systems lies in the construction of leaf profiles as well as in the technology of production and glazing. MB-Slide leaf profiles feature 3-chambered construction, they are trimmed at the angle of 45o and connected by means of suitable corner cleats. Then the corners are kneaded. Thus formed frame is then glazed and the glass panel is secured with glazing strips and gaskets. 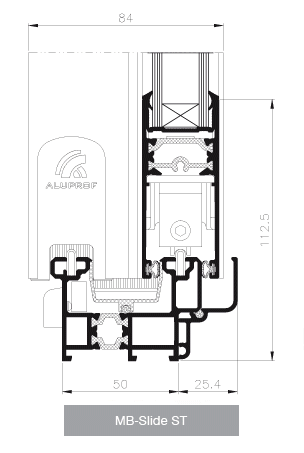 In the case of MB-Slide St the profiles have single chamber construction and they are joined by screwing vertical and horizontal profiles together by means of appropriate screws. Glass panel installation is performed at the stage of connecting leaf profiles. 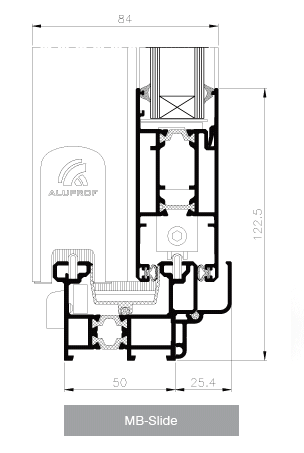 Both sliding door systems are compatible, to a large extent, with other systems manufactured by ALUPROF S.A. Adopting such a constructional assumption allowed to apply a number of common profiles, accessories and technological processes. All components of sliding door systems are compliant with the applicable standards.